‘Information & Strategy Office’ was set up in URC as an advisory team serving for Fukuoka City with a mission to contribute to the economic growth of Fukuoka City. – It is ideal to have bifocal eyes like a zoom lens to comprehend a city. – Macro eyes would help understand the position of Fukuoka on the world map from a comprehensive point of view. – Micro eyes would help capture the charms of Fukuoka from an ordinary resident’s point of view. – These are often described as “bird’s-eye view, fish’s-eye view, worm’s-eye view”. Because a city continues to change day by day like a living creature, it is necessary to look at a city from diversified points of view. – Every city looks in similar colors from the universe. – However, when visiting a city, each city has its own charms and characteristics. – Examples would include an old townscape in Europe, a modern business street in the United States, a chaotic large city in Asia, and a traditional colony in Arab. – The era pursuing the quantity and scale by mass production has shifted to the era focusing on the quality. – As a result of globalization, urban planning to enhance unique charm and context of a city has become popular. – What is the uniqueness of Fukuoka? – “Fukuoka Growth” provided the data mainly from the macro-eye view from the first issue to the previous one. – From this issue, switching to the micro-eye view, the unique “Quality” of Fukuoka is going to be thoroughly introduced. – The theme of this issue is Fukuoka’s world-class “Quality of Life”. 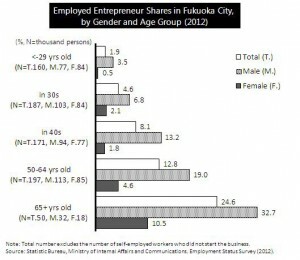 In Japan, there are less entrepreneurs than overseas. Many new companies are established not only in the countries like U.S.A. where people commonly have entrepreneurship but also in the countries where people have no other choice but start up their own business because of fewer number of jobs. In Japan, students tend to seek stability and prefer being employed by enterprises or organizations. It is also because large companies have historically absorbed relatively large number of employment.However, traditional companies and large-size enterprises have started to reduce the number of employees, and younger companies are increasing the number of employees. Startup has positive effect on employment. Japan should encourage to replace outdated companies and industries with new ones, and focus on generating new employment. Entrepreneurs are looking for the place of business activity with the global point of view. Fukuoka City aims to create a suitable place for startups in Japan, and builds up the city’s gross domestic product (GDP) which would also lead the sustainable growth of the Japanese economy. “Startup” means to “establish a new activity or business”. In the “Japan Revitalization Strategy” recently adopted by the cabinet council, “startup” is considered as an important policy, and Fukuoka City has already included “urban development as the start up city to support new challenges” in “the 9th Fukuoka City Master Plan” established last year. In order to provide the sufficient support for startups in Fukuoka City, the city with Fukuoka D.C. submitted the application for the “Global Startup National Strategic Special Zone” to the call for the National Strategic Special Zone Ideas. If this application is approved, many entrepreneurs and investors are expected to gather to Fukuoka City not only from Japan but also from overseas. 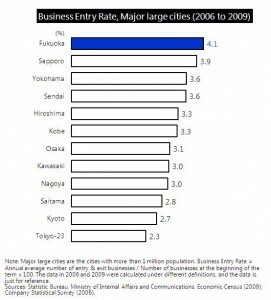 Fukuoka City is one of few urban cities in Japan where population growth is expected for the next 20 years. 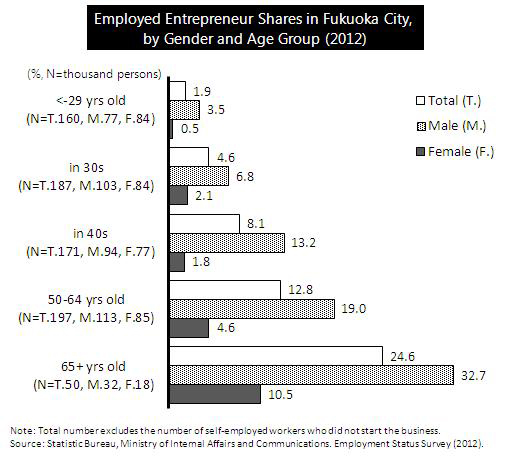 Those who aims to start up businesses in Fukuoka City will benefit from good quality of life. 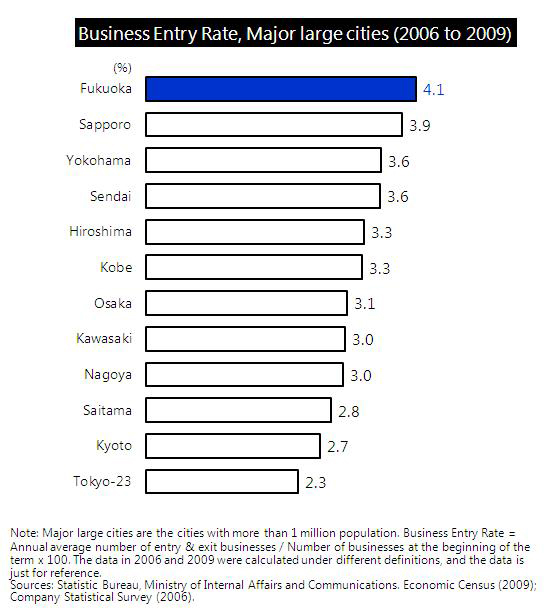 The city already has the highest business entry rate in Japan. When the ecosystem generating new businesses grow bigger in Fukuoka City by attracting domestic and oversea entrepreneurs to the city, it boosts the scrap and build of industry, and the city establishes itself and starts to grow sustainably. This is the goal of “Startup City Fukuoka”. *Click on the figures to enlarge. Data is the basis for planning. No hypothesis or forecast can be established without logical grounds based on data analysis. Data is related to various fields. To collect and analyze data is an important task. In natural science, accumulated experimental data leads to new discoveries and evolution. In business or policy making, a variety of data supports to build next strategies. Data indicates “fact” at a certain point in time from a certain point of view. In order to plan for the future of Fukuoka, it is important to analyze data from a variety of points of view and to prepare a more certain path for growth. There is a variety set of data indicating the growth potential of Fukuoka city. A series of reports “Fukuoka Growth” is going to be released twice a month. In each issue it will diagnose and discuss the future of Fukuoka city and people by analyzing data relevant to a selected theme. We hope this series of reports will be informative for those who are considering to live, study, work, invest, and start a business in Fukuoka.